St. Louis Cardinals | Clarksville Sports Network - Clarksville Tennessee's most trusted source for sports, including Austin Peay State University. Clarksville, TN – This past week in New York City, Major League Baseball held its annual amateur draft with four Austin Peay State University (APSU) baseball players having their names called, bring the all-time total to 40 players selected in the draft from APSU since the first Gov was drafted in 1972. 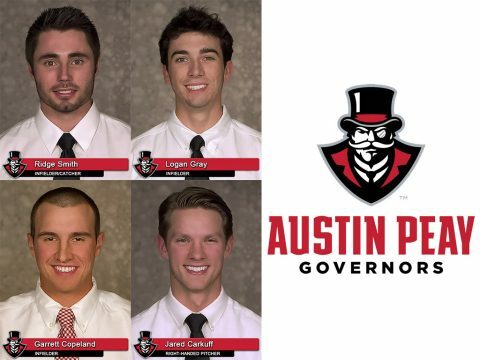 Juniors Ridge Smith (catcher), Logan Gray (third base), Garrett Copeland (second base) and senior pitcher Jared Carkuff were chosen in the 12th, 13th, 30th and 35th rounds, respectively, marking the second time Austin Peay had has as many as four players drafted at one time – and trailing only the 2013 MLB draft were the Govs had five players picked. When the news broke that Jonny Venters was having another Tommy John surgery and would be lost for this year and perhaps most of next, it was met on Twitter with… well, basically a shoulder shrug. ST. LOUIS — The Cardinals will arrive at Spring Training with few position battles to sort out, a luxury that is the byproduct of minimal offseason turnover. The second base situation, however, cannot be considered so settled. With Skip Schumaker now a member of the Los Angeles Dodgers, the Cardinals’ depth chart at the position has dwindled by one. Schumaker’s departure came four months after the Cardinals dealt Tyler Greene, meaning that only one of the three players who competed for the second base job last spring remains in the organization. That would be Daniel Descalso, who is currently positioned as the favorite to win the starting second base job in 2013. However, neither manager Mike Matheny, nor general manager John Mozeliak has promised away the job just yet. Rather, the Cardinals are taking an opportunistic approach when considering a middle infield addition. The list of middle infielders still available on the free-agent market is mostly underwhelming, which leaves the trade market as the one avenue left if the Cardinals desire an impact player. More likely, though, is that the Cardinals keep the battle internal. Descalso will obviously be in the mix, as could Matt Carpenter, Pete Kozma, Ryan Jackson and even Kolten Wong. Those latter four have only a combined 78 innings of Major League experience at second base. Carpenter may be the most interesting variable, as his level of comfort at the position won’t be entirely known until Spring Training. Sent home with the directive of putting in extensive work at second base this winter, Carpenter intends to arrive at Jupiter, Fla., days before the start of camp to prove that his work has been fruitful. It could well come down to whether the Cardinals want to emphasize the bat or the glove in their selection of a second baseman. If the Cardinals prefer the sounder defensive option, Descalso would likely get the nod. Carpenter has more offensive potential and could be a key piece in the lineup. Kozma played more second base in the Minors than Jackson, though both should get some time at the position this spring. Questions remain, though, about how either would fare in an everyday role over a full Major League season. Then there’s Wong, the wild card of the bunch. The potential of a former first-round Draft pick is seemingly higher than anyone else in this second base mix, but the timing might not yet be right for him to make a Major League impact early in the 2013 season. Wong, who spent all of 2012 in Double-A, is more likely to begin the season as the starting second baseman at Triple-A Memphis. Should the Cardinals have a need at second base at midseason, don’t be surprised if Wong becomes a serious part of the discussion. This second base situation sets up to mirror the multi-player competition that took place last Spring Training. But while that competition did not conclude with a definitive answer, the Cardinals would prefer one of these candidates to emerge the clear choice in 2013. ST. LOUIS — Hopeful that the trade can benefit both parties, Skip Schumaker, speaking shortly after the Dodgers finalized a deal to acquire the utility infielder/outfielder, expressed gratitude for the opportunities the Cardinals had given him for more than a decade. Schumaker also conveyed his excitement about a new opportunity in an ideal location. The Cardinals traded Schumaker to Los Angeles last Wednesday for Minor League infielder Jake Lemmerman. Schumaker’s departure ended an 11-year tenure with an organization that drafted and developed him out of the University of California, Santa Barbara. Schumaker went on to make his Major League debut with the Cardinals in 2005, establishing himself as a versatile bench player and valued teammate. Schumaker and his family also still maintain their permanent residence in Southern California, approximately an hour-long drive from Dodger Stadium. That will allow Schumaker to live at home during the season. He said it’s a no-brainer that he’ll make the daily commute. When Schumaker signed a two-year contract with the Cardinals exactly one year ago, he never intended finishing out the deal elsewhere. But it became evident during the second half of the 2012 season that Schuamker’s role was permanently diminishing. He started only 29 games after July (none in the postseason) and watched Daniel Descalso emerge as the team’s everyday second baseman. Curious about how the Cardinals viewed Schumaker’s standing for 2013, his agent, Nez Balelo, met with Mozeliak during the offseason. Schumaker, through Balelo, did not demand a trade, but it became evident that both clubs saw it as mutually beneficial to separate. In joining the Dodgers, Schumaker will be reunited with Los Angeles’ new hitting coach, Mark McGwire, who began working with Schumaker even before he returned to the Majors in a coaching role, and longtime friend and former Cardinals teammate Nick Punto. Schumaker said he has not yet discussed his potential role on the team with manager Don Mattingly and general manager Ned Colletti, but he expects that he’ll serve as the team’s fourth outfielder and backup second baseman. Schumaker ends his Cardinals career with a .288 batting average, .345 on-base percentage and 211 RBIs in 810 games. He’ll face his former club for the first time during a three-game series in Los Angeles from May 24-26. The Dodgers then travel to St. Louis in early August. ST. LOUIS — Desiring to add a versatile right-handed hitting veteran player to the 2013 club, the Cardinals found a fit in Ty Wigginton, whom the club signed to a two-year contract on Friday. The club made the signing official after Wigginton traveled to St. Louis to undergo a team physical. Wigginton, 35, has played all four infield positions and both corner-outfield spots during his 11-year career, which began with the Mets in 2002. Most recently, his playing time has come primarily as a corner infielder/outfielder. He spent the 2012 season in Philadelphia, where he hit .235 with 11 homers and 43 RBIs in 360 plate appearances. Wigginton said he weighed offers from about four teams before settling on signing with the Cardinals, who contacted him early in the free-agent process and maintained a dialogue throughout. The addition of Wigginton will give the Cards’ bench both some experience and a right-handed bat with power potential. Both were areas in which the club was deficient last season, as Shane Robinson and Tony Cruz were the team’s best right-handed hitting options off the bench for the majority of the campaign. General manager John Mozeliak entered the offseason specific in noting his intentions to upgrade the bench with a right-handed bat. Wigginton’s career has taken him to New York (2002-04), Pittsburgh (04-05), Tampa Bay (06-07), Houston (07-08), Baltimore (09-10), Colorado (’11) and Philadelphia en route to St. Louis. He has finished with at least 15 home runs in six different seasons and has a career .263 batting average. As a pinch-hitter, Wigginton went 5-for-33 with three RBIs in 2012. Over his career, he has a .233 batting average in 103 pinch-hit opportunities. NASHVILLE, Tenn. — In a Winter Meetings week where free agency’s biggest chips didn’t fall and several clubs committed significant dollars to players falling in the middle tier, the Cardinals stayed removed from the headlines and maintained a narrow focus. The team’s primary objective upon arriving in Nashville was to find left-handed help for the bullpen. Club officials departed on Thursday having achieved that by securing the services of Randy Choate, who was added to the roster last Friday after passing a physical in St. Louis. The Cardinals’ early read on the free-agent market was that the available lefty relievers would be snatched up fairly quickly. Knowing there would be competition in the thin market, the Cardinals were willing to offer Choate a three-year deal. St. Louis also laid the groundwork for possible upcoming offseason transactions. The team still intends to improve its bench by adding a veteran right-handed bat, though it may take several more weeks for the club to find the right fit. There’s also a strong chance a middle infielder will be added before Spring Training opens in February. The team will continue to take offers for outfielder/second baseman Skip Schumaker, who has talked to the club about desiring the opportunity to receive regular playing time. With the composition of the Cardinals’ current roster, it doesn’t look like the opportunity will exist in St. Louis. Deals done: The Cardinals reached a three-year, $7.5 million agreement with Choate last Wednesday and intend to make the signing official last Friday. The Cardinals already have an opening on their 40-man roster, so it will not be necessary to make a corresponding move in order to make the deal official. St. Louis has also signed a pair of players — corner infielder/outfielder Jamie Romak and outfielder Justin Christian — to Minor League deals. Christian’s agreement includes an invite to participate in Major League camp next spring. Romak, who spent more than half of the 2012 season with the Cardinals’ Double-A affiliate, will compete for a Triple-A job. Christian has a strong chance to be a part of the Cardinals’ Triple-A starting outfield next season. Rule 5 Draft activity: As expected, St. Louis did not make a selection in the Major League portion of the Rule 5 Draft. The club also did not lose any of its unprotected players in that round. In the Triple-A portion of the Draft, the Cards plucked third baseman Matthew Cerda from the Cubs and left-handed pitcher Jay Voss from the Tigers’ organization. The club also lost catcher/first baseman Steven Hill to Oakland in that phase of the Draft. Hill, who appeared in nine games for the Cardinals in 2012, was taken off the team’s 40-man roster last month. Cerda played 111 games in 2012, the majority of those with Chicago’s Double-A affiliate. He hit .241 and posted an on-base percentage of .374. Cerda, a fourth-round selection in the 2008 First-Year Player Draft, will compete with Jermaine Curtis for the organization’s Triple-A starting job at third base. “He’s a good on-base-percentage guy, hits for average and is solid defensively,” said farm director John Vuch, who also noted that he was atop the team’s wish list in that portion of the Draft. After a breakout season in 2011, Voss underwent Tommy John surgery in May 2012. The Cardinals have read encouraging reports about Voss’ rehab and expect that he’ll be ready to pitch shortly after the start of the season. Voss, a 25-year-old left-hander, will initially pitch out of the bullpen, though the Cardinals haven’t ruled out the possibility of eventually moving him into a starting role. Goals accomplished: In landing Choate, the Cards secured a lefty specialist for the bullpen. The club arrived at the Winter Meetings having set this as the primary goal, knowing that the market for lefty relievers was likely to dry up fast. Choate will join Marc Rzepczynski as a second lefty in the ‘pen and will give the Cards the traditional left-on-left specialist the team lacked in 2012. Unfinished business: The club’s attention now turns to building its bench, which still could see the addition of a middle infielder and right-handed-hitting veteran this winter. Players fitting both of those roles remain on the team’s radar. The Cardinals may, however, wait a while before addressing their bench needs; by doing so, the club can wait for free agents who are currently seeking starting jobs to lower expectations as Spring Training nears. The team is also still gauging outside interest in Schumaker, who appears likely to be dealt before the start of Spring Training. ST. LOUIS — It was one year ago at this same Winter Meetings setting that Mike Matheny began his indoctrination. A somewhat surprise hire as Cardinals manager given the absence of previous experience, Matheny arrived at Dallas’ Hilton Anatole poised to soak in all that came with the new position. With the Albert Pujols negotiations taking precedence, it turned out that Matheny hardly had an opportunity to leave the team’s hotel suite. History has documented the outcome of that negotiation, but Matheny can now look back on it as the first movement on the learning curve that he has experienced over the past 12 months. He arrived in Nashville on Monday no longer a rookie manager and without the detractors who questioned his readiness for the position. For less than two months earlier, Matheny had guided an 88-win Cardinals team to within one win of a return to the World Series. Lessons were learned, though, and Matheny delineated some of them on Tuesday, having had enough time since the end of the postseason to appropriately reflect. Matheny said he intends to be more deliberate in resting his team’s veteran position players, some of whom experienced physical breakdowns as the season progressed. It’s a group that, most notably, includes Rafael Furcal, Carlos Beltran and Matt Holliday. While Furcal was the only one of the bunch to actually land on the disabled list, Beltran and Holliday dealt with persistent nagging issues. Both still regularly lobbied to remain in the lineup, and Matheny, more often than not, obliged. That was especially the case late in the season when the team was making a run for the second NL Wild Card. Matheny may get a second go at a second-base competition, too, next season, depending upon what (if any) additions the Cardinals make this winter that could shake up the outlook of that position. Matheny employed a second-base rotation of Tyler Greene, Daniel Descalso and Skip Schumaker for much of 2012, not settling on a regular until late in the year. Descalso, along with Matt Carpenter, Kolten Wong and Pete Kozma, could be in the mix for playing time at second next year. Assuming that Furcal does not experience any health setbacks, second base is set to be the only position of question heading into Spring Training. The priority when it comes to filling that position will be on the defensive end, Matheny said, given how many offensive pieces the Cardinals have in place elsewhere. The key then is finding a way to ensure better overall consistency from the rest of the offensive unit. Despite placing near the top of the NL in several offensive categories, the Cardinals experienced several prolonged offensive outages, which hampered the team’s ability to get on many extended winning streaks. “Believe me, we stayed up nights at times trying to figure it out when we saw an offense throw 15 runs up and then go three games in a row without scoring a run,” Matheny said. “It’s frustrating. It’s frustrating for them. It’s frustrating for our staff. It’s frustrating for our fans. NASHVILLE, Tenn. — Expecting an already limited market for left-handed relievers to thin even further by the end of the Winter Meetings, general manager John Mozeliak made his move on Wednesday. With their first dip into free-agent activity this offseason, the Cardinals reached an agreement with left-hander Randy Choate. The southpaw, 37, will receive a three-year, $7.5 million contract after he passes a physical, which is scheduled for Friday in St. Louis. The organization is delaying comment about the deal until after it becomes official. St. Louis has few holes to fill on its roster before 2013, but finding a second southpaw to join Marc Rzepczynski in the bullpen was among the team’s top priorities. The Cards were eyeing a specific sort of lefty, too, one who could fill a lefty-on-lefty specialist role. Choate fit that bill better than any other available southpaw reliever, including Sean Burnett, who doesn’t profile so much as a lefty specialist. Though the Cardinals did meet with agents representing other lefty relievers, Choate was the team’s target from the start. Choate will be 40 by the time this contract expires, but he also will not be putting the innings load on his arm that most relievers do over the course of the season. Choate made 80 appearances in 2012, which he split between the Marlins and Dodgers, but tossed only 38 2/3 innings because of how he was used. Choate limited left-handers to a .158 batting average last year, and over the course of his 12-year career, left-handed hitters have batted .201 off him. By using Choate almost exclusively against left-handed hitters, the Cards will free up Rzepczynski to be a more flexible middle-innings option. Edward Mujica and Mitchell Boggs will remain in setup roles ahead of closer Jason Motte. With the bullpen now settled, the Cardinals can turn their attention to the bench, which still needs to be pieced together. While St. Louis is unlikely to pull off a trade or sign another free agent before departing Nashville on Thursday, groundwork has been laid for future transactions. Having vetted the available bench options, Mozeliak said it’s more likely the organization will upgrade through signing additional free agents rather than making a trade, though the latter option hasn’t been entirely dismissed. By waiting until deeper in the offseason, the Cardinals expect that players who are currently seeking starting opportunities will eventually reduce those demands. St. Louis, which can’t make such everyday promises to position players, can then jump into the mix when expectations change. The Cardinals would like to add a veteran right-handed hitter and could boost the team’s outfield depth with such an addition. The organization also remains interested in adding to its middle-infield options. As the Cards look to address their bench, they’re also mindful of personality. With the club having already lost the affable Lance Berkman and likely to trade popular clubhouse figure Skip Schumaker, the Cardinals will seek bench players who can also contribute in the clubhouse environment. One avenue through which the Cards are not likely to add is in today’s Rule 5 Draft. Mozeliak projected the Cardinals’ involvement in the Rule 5 Draft as “unlikely” until the Minor League portions of it. The Cardinals do have one opening on their 40-man roster if they were to choose to make a selection. NASHVILLE, Tenn. — With no need or desire to go after this winter’s top crop of available free agents, the Cardinals remained under the radar during a relatively quiet Day 1 at the Winter Meetings on Monday. General manager John Mozeliak and the team’s baseball operations department descended upon the Music City late Sunday night with their priorities clearly outlined. The team still seeks a left-handed reliever and expects to know before everyone scatters on Thursday whether the free-agent market is going to be the best place to address that need. Improving the club’s middle-infield depth and finding a veteran right-handed hitter remains objectives, as well. In speaking to reporters from his suite late Monday afternoon, Mozeliak said that he believes “this week will help bring some conclusions” in terms of the left-handed relief market. Sean Burnett remains the most attractive available lefty reliever, though a hesitancy to commit too heavily to him in terms of dollars and years could preclude the Cardinals from making a serious run. Asked about the possibility of handing out a multi-year deal to a reliever, Mozeliak said it’s still too early to determine if the Cards will move in such a direction. The ascension of young lefties Sam Freeman and Kevin Siegrist might not make such a long-term commitment necessary. Free-agent relievers, in general, have done well already this offseason. Jeremy Affeldt and Jonathan Broxton are among those who positioned themselves to receive lucrative, multi-year deals. Even Joakim Soria, who missed all of the 2012 season while recovering from Tommy John surgery, is reportedly close to finalizing a two-year deal with the Rangers. The Cardinals understand how all of these multi-year contracts have had a trickle-down effect on the rest of the market. The shortage of free-agent lefty relievers has prompted the Cards to look at trade options. The club will not, however, pay too steep price (i.e. give up one of its top young pitchers) in order to secure one. As the Cardinals work to construct their bench, they do so with an eye on another middle infielder and a veteran bat, preferably a right-handed one. Mozeliak was asked if there was a preference on what position such a bench player would fill. � He downplayed any expectation that he would meet with Steve Hammond, Adam Wainwright’s agent, during the Winter Meetings to discuss a contract extension for the right-hander. Wainwright’s current contract runs only through 2013, and there seems to be mutual interest to get an extension finalized before the righty would become a free agent. � Asked if the organization’s young pitching had been attracting interest from other clubs, Mozeliak laughed. “Quite a bit,” he said. And while the Cardinals are not looking to deal from that particular position of strength, Mozeliak said the team would consider any offer if it’s at a fair price. � While utiltyman Skip Schumaker has not formally requested a trade from the Cardinals, Schumaker’s agent, Nez Balelo, has spoken with Mozeliak about “looking for perhaps a better place to get more opportunity.” Schumaker is set to earn $1.5 million next year. If he stays, Schumaker would provide a versatile bat off the bench. The Cardinals do not, however, plan to consider using Schumaker as an everyday second baseman. Schumaker’s playing time diminished substantially during the second half of the 2012 season, after the club increased Daniel Descalso’s exposure at second base. ST. LOUIS — A year after arriving at the Winter Meetings under the glare of the national spotlight, the Cardinals will travel to Nashville, Tenn., for this week’s Winter Meetings with a much more modest list of goals. Gone is the urgency of negotiating with a superstar. In its place is the much more manageable task of finding complementary pieces for a ballclub that is retaining most of its 2012 core. In particular, that means finding left-handed relief help, boosting the bench and fortifying the middle infield. The Cardinals’ offseason activity thus far has been mostly administrative, tweaking the 40-man roster and officially parting ways with the club’s only two free agents — Lance Berkman and Kyle Lohse. Aside from signing Rob Johnson to a Minor League deal, the Cards have not been involved in any signings. There is little indication, too, that any additional impact additions are on the horizon, even though Mozeliak confirmed that conversations are ongoing regarding several players. With many key offseason transaction dates falling earlier this year due to changes made in last year’s Collective Bargaining Agreement, the chance for a flurry of Winter Meetings activity is increased. Finding a second lefty reliever to join Marc Rzepczynski in the bullpen will not be easy given the available list of free agents. With Jeremy Affeldt already off the board, remaining left-handed options include Sean Burnett, Randy Choate, Michael Gonzalez, J.P. Howell, George Sherrill and Will Ohman. It’s a mostly underwhelming group through which to sift. The weakness of the market could force the Cardinals into looking elsewhere to fill such a hole. With the organization confident in Rafael Furcal’s ongoing recovery from an elbow injury, the need to find another shortstop has diminished. As a result, the Cardinals can instead focus their efforts on finding an infielder who could play either middle-infield spot. This would increase the club’s depth at both positions. “That’s still something that we’re kicking around,” Mozeliak said in regards to focusing attention in that area. The Cardinals’ bench can be fortified without having to spend significant dollars. Adding a right-handed hitter with some power would be ideal given the makeup of the club’s current roster. St. Louis has enough flexibility within its payroll to be able to add all such pieces, since no high-cost additions are needed. Though the club eliminated close to $24 million by letting go of Lohse and Berkman, it will take on a comparable amount of salary by accounting for raises due through other contract increases and the arbitration process. In the end, the team’s payroll will likely total somewhere near the $110 million figure. The Cardinals could very well spend four days at the Gaylord Opryland Hotel in Nashville this week without making any sort of splash. But with baseball executives and agents all under one roof for several days, there will certainly be discussions and potential groundwork laid. The Winter Meetings will close on Dec. 6 with the Rule 5 Draft. In order to select a player in that Draft, the Cardinals will have to keep a spot open on their 40-man roster. Currently, the club has 39 players on its roster.